To be apex national healthcare accreditation and quality improvement body, functioning at par with global benchmarks. national/international standards,through process of self and external evaluation. 4. Indian Medical Association (IMA). 6. Insurance Regulatory & Development Authority (IRDA). 9. Director General of Armed Forces Medical Services,Misntry of Defence. 10. Directorate General of Health Services (DGHS), MoHFW. 11. Dean, Maulana Azad Medical College. 13. Chair Health Committee – CII. 14. Chair Health Committee - ASSOCHAM. 15. Chair Health Committee - FICCI. 16. Academy of Hospital Administration (AHA). 17. Health Sector Skill Council. 19. 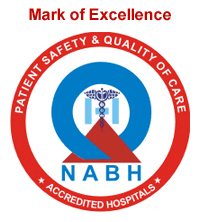 Chair – Accreditation Committee – NABH. 20. Chair – Hospital Technical Committee – NABH. 21. Chair – Appeals Committee – NABH. 22. Drug Controller General of India.